A more faithful and mature adaptation of Tolkien's book. More serious and maturer, with better pacing and more faithful to Tolkien's book. To make the most faithful edit of Tolkien's book. Some audio from FOTR, TTT and "Game of Thrones". Some video from TTT and "Game of Thrones". There are more than 230 changes. I'm going to put the most relevant. Seemed perfect to me. Blu-ray quality. File was huge though, so I guess that's expected. I haven't seen the theatrical or extended in a while, but I noticed lots of cuts. I wouldn't necessarily be able to tell what was cut, but it was obvious to me in several places that something was off visually or that there was a narrative jump. The most obvious being the rearrangement of clips for dealing with Sam's absence at the spider cave. Although a clever idea, I don't think it works in practice. It's the weakest part of the edit, and as one reviewer put it, seemed obviously fan-made. Mostly good. Levels were a bit inconsistent, which at times may have been a fault of the source, but FX, dialogue and music were not well balanced. Dialogue was, in fact, impossible to hear on occasion - specifically, when characters spoke under thier breath. I noticed some alterations in score, but nothing jarring. A bit off in places. Some restructuring worked, some didn't. Pippin running around randomly after noting Faramirs survival and then appearing back at the top again was odd. Golem not sprinkling crumbs but crumbs appearing on Sam's shirt was odd too, let alone the other stuff that followed for that part of the story. The Kings burning felt cut too short as well. The general pacing of the whole film, however, was excellent and the time flew by. In that respect it flowed far better than the theatrical or extended. Lovely to see so many awful CGI craziness gone as well. Less Legolas antics - beautiful. Gimli felt hardly present though... I'm assuming much of him was cut. Also, personally, for me, the ending is still far too bloody long. Let me start by saying that I am not a Tolkien "purist" in terms of the movie - Some creativity is ok if it makes the adaptation better. 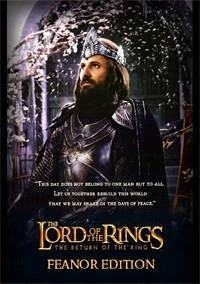 When the Return of the King movie first came out, I was expecting a lot from it. The theatrical cut was ok, but it had some annoyances and clearly left out some bits, so I was eagerly waiting the extended edition. Unfortunately almost all the additions in the extended version just let me down. Feanor Edition corrects this to a major degree. All the things that annoyed me in PJ's versions are cut/changed. Visual and audio editing is excellent, save a couple of scenes where I could tell it's not "original". This came close to being a perfect version of the movie, which I would some day still like to see. Unfortunately there is one major issue I have with this edit that takes away from my enjoyment. Still, Feanor edition is good, and I recommend to watch it. I am going to shortly describe things that caught my eye when viewing this. 1. Saruman: this is just perfect. 2. Changes to Denethor: very good. 3. Lighting of the beacons: I felt this could have been better. Now the viewer does not know what they are. I think in their first appointment, Gandalf could have asked Denethor to "call for aid from Rohan by lighting the beacons" and that would have established what the beacons are. When Denethor "lights them", the cut is kind of too quick. Also in Rohan it was cut a little too short - I would have liked to see Aragorn's line "the beacons are lit, Gondor calls for aid". And Theoden's "And Rohan will answer". 4. Drinking game, Gimli jokes etc cut out - very good. There is just one big problem. This scene sets the biggest issue I have with this edit: No reforging of Narsil to Anduril, Aragorn just has it in the scene. I know that in the books he gets it already in Rivendell, but it just wont work even if edited in the movies, because we see him so much with the other sword throughout the trilogy. There is just no other way than Elrond (or if somenone could edit it to Elronds son) bringing it to Aragorn in ROTK (Their dialogue could be trimmed though) - it just fits so well into this movie (and in the book he gets the Flag made By Arwen, this would symbolise that). That would also mean the palantir should most likely go back where it is in the original version... It would still be great though if Aragorn would 'win' the palantir confrontation - like he does in this edit. 6. A little related to the previous, we see Arwen only in the end of the movie, I think it would be good to show her earlier too (Aragorn dreaming, reforging of the sword scene?). 8. Sam vs Gollum in front of Shelobs lair: Very good cuts story wise! However I could see they were "fan made" (or maybe I just remember the original it too well). 9. Gandalf vs Witch King: Excellent! 10. Denethors death: Good cuts! 11. Legolas stunts with the mumakil is out, good. 12. Eowyns fight with the Witch King... I would have liked this to be longer (He is so cool), but not a big deal. 14. House of Healing cut out a little too short... We don't see Faramir with Eowyn (I remember they met there in the book?) - why this cut? 15. Saurons mouth at the gate: Good adaptation - No head cutting! This was an issue for me in PJ's version. I would still kind of like Gimli's line "I guess that concludes negotiations" in the end, I think it fits here. It would be great if this scene could be made like in the book, Aragorn just staring him down, but I guess there is no way. Just an idea that popped into my mind writing this: Cut out Sauron's mouth at the gate alltogether, make him show Frodo's shirt and the confrontation between him and Aragorn inside the palantir in the scene where Aragorn is viewing the palantir! 16. The farewells still feel long, but I guess there is nothing you can do about it. I just hope I was as skilled as Mukankakuna, or even had any skill so I could make my own "perfect" version. In the meantime, this will probably be my go to version. This was a real enjoyment. This edit removes all those details that took you "out" of this movie. 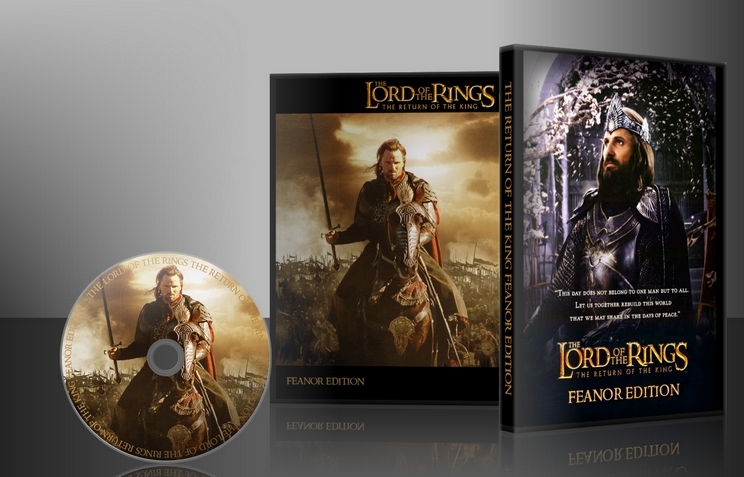 There are no more silly jokes, no more feeling that the commercial focus of this movie spoiled the final chapter of the LOTR Trilogy. I especially liked the way Mukankakuna handled the Army of the Dead. Now they feel a stronger role, and not as simple as they seemed in the movie. Also the Denethor fixes are a relieve. Simply put, the faneditor's view makes this movie better. More serious. More enjoyable. Theatrical releases: I loved The Fellowship of the RIng. It was magical, and if it were a pillow, I'd hold it between my thighs every night. The Two Towers was rather OK—it did the job, but I wasn't in love. But The Return of the King was a true stinker in my eyes. . . er, nose. Aside from a few scenes that took my breath away, it seemed like a showcase for WTFish creative writing (for shame, Boyens & Walsh) and stupid CGI tricks. In rides Mukankakuna with his Big Kahuna scissors, and now we get to see a refined version of RotK that's largely free of cringe. Denethor the Donkey Kong fireball? Extinguished. Legolas the tusk rider, Denethor the messy eater, Frodo the dismisser—all expunged, righteously expunged. No offense to Sharkey and Hal9000, but what remains is a purist edition of the movie that's even more puristy than the Sharkey editions. Yeah, whoa. It's been a while since I've spun the RotK EE discs, so I'm sure I didn't notice all the changes and cuts. But what I saw didn't jar me out of my Middle Earth experience, and when hankering for a Lord of the Rings fix, I couldn't ask for anything more. P.S. Does anyone know why orcs sneaking into Osgiliath need to carry so many torches? I'm happy. Detailed review to follow. Not exactly what I would have done, but probably better.